The piece in the Uffizi Gallery by this 13th Century artist is, Christ the Redeemer and four Saints, is known as one of his only works. Though little is known about the painter and it is not known for sure who this Florentine was. The signature reads simply, “Melior”, and he has been identified as Meliore dipintore, populi Sancti Jacobi tra le fosse, meaning Meliore the painter, of the Parish of Saint Jacob between the Ditches. He is documented as enlisted in the Battle of Montaperti in 1260. 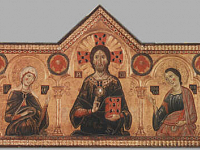 There is record of another artist named Megliore di Jacopo from Pistoia, but it is unknown if they are the same. (Grove Dictionary of Art).